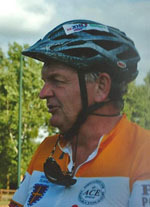 The Paris to Hayling Charity Cycle Ride started in 1986, when Peter McQuade, now President of the Ride, cycled alone from Paris to Hayling raising money for cot death research, following the death of the baby daughter of two close friends. Like many subsequent riders he had no great cycling experience. However, as the trip turned out to be easier than he had anticipated he persuaded another 17 cyclists to join him the following year. See a gallery of photos from previous rides.